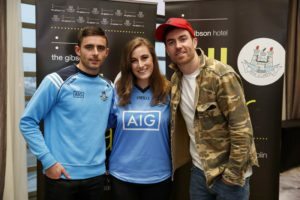 Wednesday evening saw the return of dubzone, the true blue fanzone event to the gibson hotel. 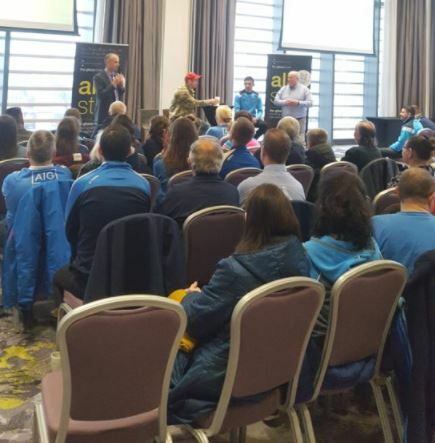 The event marked the long serving partnership between the hotel and Dublin GAA. Entitled #DUBZONE18 the evening saw 2FM’s very own Robbie Irwin take hold of the microphone as designated master of ceremonies. Representing the boys in blue were Dublin senior football stars Michael Darragh MacAuley, or MDMA as he is loyally known, and fresh new talent Niall Scully. 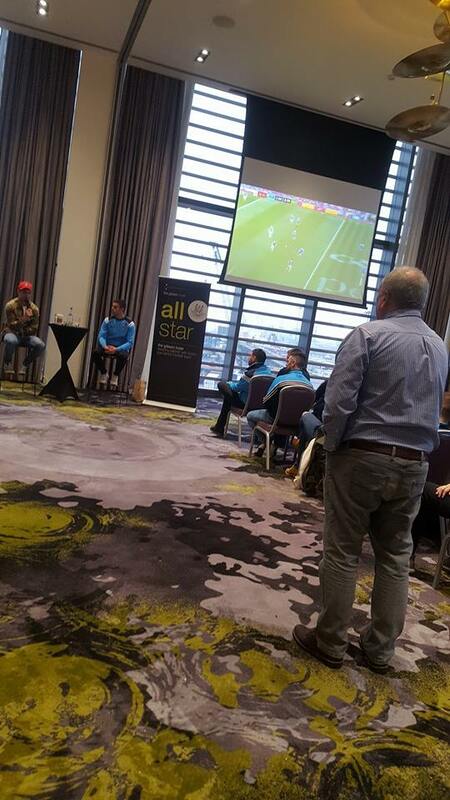 The special fan event saw the recent league champions take to the hot seat for an intimate Q & A evening which saw over 60 true blue Dublin fans turn up to ask the brass tacks questions dear to them. 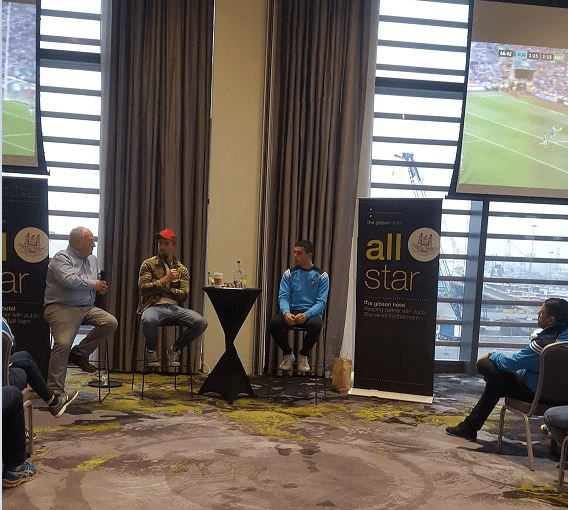 Fresh off their league final win over a tough Galway challenge the players spoke in detail about winning and the challenges of consistently incorporating a winning mentality from year to year. ”Jim calls it the bit of tin & it’s always great to add a national title to the CV”, said Niall Scully when speaking on the latest cup in Dublin’s bustling trophy cabinet. Robbie Irwin spoke about the topical issue of the super 8 format. Whereby, the upcoming 2018 football championship has been changed drastically with the GAA Congress opting to vote in a round-robin or ‘Super 8’ format to replace the current quarter finals system. – MDMA explains how sacrifice is part and parcel of being successful. 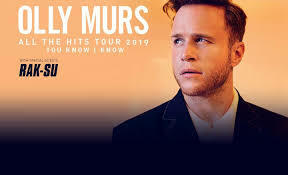 Specifically, in relation to his music calendar feeling the impact of a busy summer season ahead. When asked his thoughts on the new super 8’s Senior Football Championship restructuring MDMA revealed with tongue in cheek, ”each year I mark all of the gigs & concerts I want to go to – all I know is that the super 8’s is killing my music calendar’. The 5 time All-Ireland winner seemed to take the new structure in his stride turning his attention to the conflict between the new championship format and his music checklist. ‘It’s all good though we are putting focus on our training at the moment but will take it game by game and stick to Jim’s process’. Certainly, it was clear to anybody in the room, winning isn’t about luck for this group of players. Sacrifice plays a massive role. Winning is certainly a habit and when asked about potential All Ireland contenders it was a case of the usual suspects again for MaCauley. ‘Mayo are a very good footballing team, the last All-Ireland was won by a point so we are well aware what it’ll take from us as group to compete again at a high level. 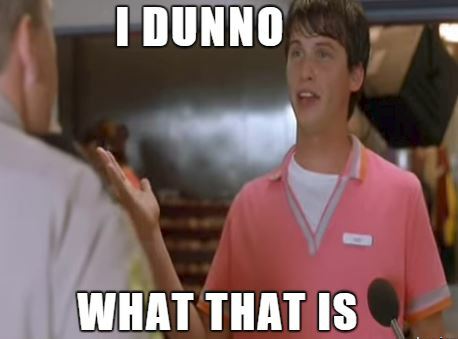 Definitely though. they’ll be there or there abouts this year”. When giving a few opening words General Manager Garret Marrinan described the special relationship between the hotel and the team.”The gibson hotel has been an official partner of the Dublin GAA Football team for almost 5 years now and we are delighted to be a part of this fantastic journey with Jim Gavin and this special group of players”. With 4 All Ireland’s collected in that space of time it’s apparent that the relationship is a winning one. Before the short bus to Croke Park, pre-match, the group kicks back in the gibson’s stratocaster meeting room. ‘Sometimes we go and chill out on the bean bags and relax a little bit, it helps”, explains MDMA. 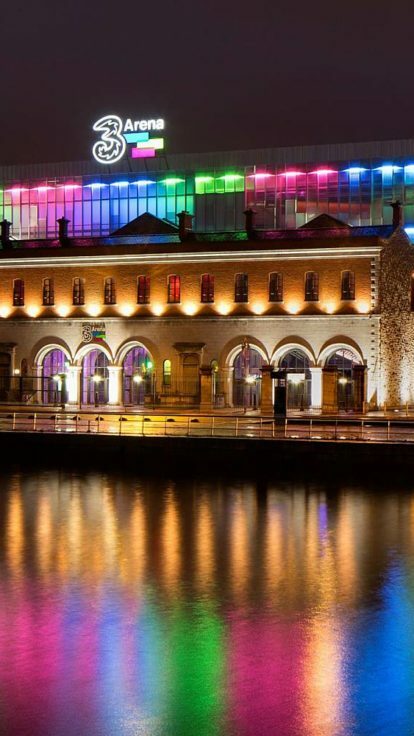 Structure is central to the teams success and the familiar surroundings of the gibson hotel are a key part of that. Everything from, pre & post match meals to pre-match team talks happen in the hotel. The phenomenal level of support for the Dublin team was evident from start to end on Wednesday evening. Fans lined the stratocaster floor to wait for a cherished photo of their heroes. Young and old were all inspired by the unified message of dedication from both players. Watch this space, the Dubs may have won 5 All Ireland championships since 2010 but the overall sense is; they’re not done just yet. 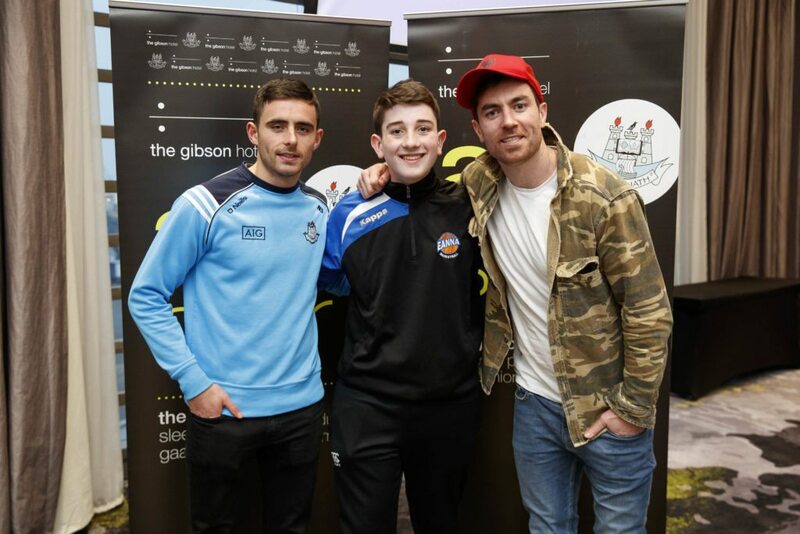 Oisin Cullivan pictured at the #dubzone18event the gibson hotel hosted for GAA fans with Dublin GAA Senior Football players Niall Scully and Michael Darragh MacAuley. 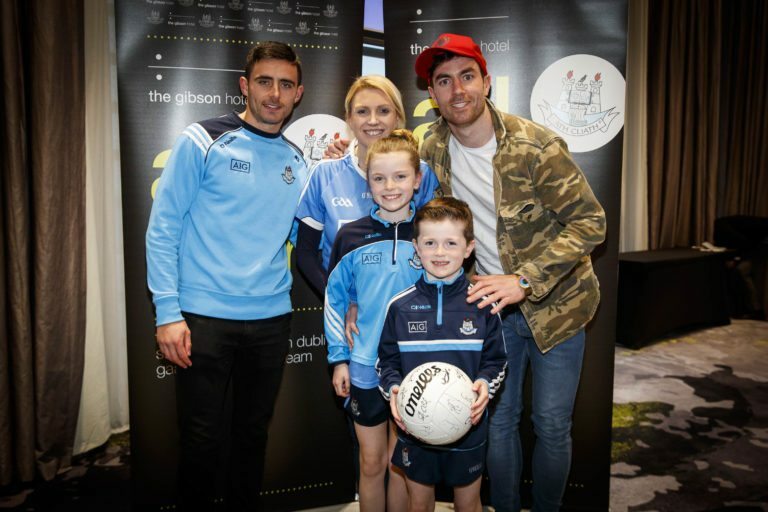 The gibson hotel is a sponsor of the Dublin GAA Senior Football team.